Will Confederacy History Be Annihilated? What happens when all signs of the Confederacy disappear? Will we become a more peaceful, compassionate or even more civil society? Will our history change for the better? Will our past transgressions disappear? I think not. She commented that the murderer wanted to start a ‘race war’ but that this opportunity of removing the flag would prove him wrong, and that the opposite would happen. Violence only begets more violence. Her ‘act of peace’ in South Carolina in 2015 has resonated throughout the Southern states, including my beloved Texas, and my hometown of San Antonio. What was first believed to be an act of healing has become an act of chaos, disrespect, cowardice, vengeance, and hatred. It started when Bexar County Commissioner’s Court voted to take down four plaques around the court house in 2015 dating from 1936 to 1956. It was County Judge Nelson Wolff who said, “We’re simply not going to glorify a symbol of hate.” Really, judge, how much hate is there in Bexar County when a black woman is voted to be the mayor of San Antonio. Doing some research I found that Samuel Augustus Maverick used this property for his orchard. After he died in 1870, the land was deeded to the city and an 1873 map calls the square Travis Plaza, named after Col William Barrett Travis, commander of the Texan troops at the Alamo. What I find most deceiving and conniving is the way the statue was brought down. Not only was it done in the middle of the night in a cowardly act by order of city council, but it is who instigated this mean- spirited travesty. The monument was taken down at 2:00am on September 1, after standing for over 100 years. We all know that Mayor Ron Nirenberg is a liberal/progressive and all of the council members are progressive or moderate, with one exception, District 10 councilman William Perry. District 1 councilman Roberto Trevino was joined by District 2 William ‘Cruz’ Shaw who stated that he found ‘it’ offensive and reminded him of slavery and people being lesser than others. He used the word ‘offensive’. I find his vote and words extremely offensive. 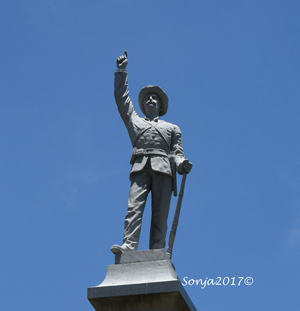 These men I find particularly ‘offensive’ since they claim that the ‘monument’ finds that blacks in the community are ‘subjugated’. It appears that the opposite is taking place. I can’t help but write that there are about 135,000 blacks, about 1 million Hispanics and about 500,000 Anglos in my native city. Mike Lowe and Johnathan-David Jones are both Black Lives Matter activists and Jones is not a native San Antonian. They were also photographed by an Express News photographer during the council meeting to remove the statue. The following information is from The Rivard Report: Johnathan-David Jones, a Houston native, is a community activist and former UTSA student. 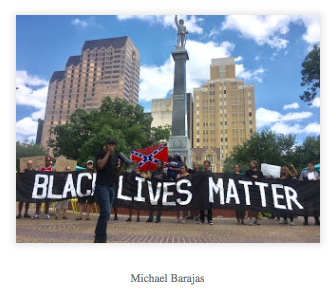 He has organized rallies in San Antonio largely surrounding the victims of police brutality. Mike Lowe is a member of the infamous Black Lives Matter and was present at the Independence Day rally to remove the statue. The following information is taken from the SA Current magazine. “Mike Lowe, a local BLM activist who’s led marches against police brutality in the city, called the monument “part of a heritage built on hate and the subjugation of black people.” This same article lists Johnathan-Davis Jones as a member of the BLM and the leader in organizing the Independence Day event to remove the statue. It has been my understanding that there is no police brutality in San Antonio but who knows maybe these two will find the ‘brutality’ simply because they are really looking to turn San Antonio into a BLM magnet. Remember all this courtesy of your city council and police chief that is allowing scum to lead the way. The other incident is dear to my heart because I have family that graduated from Robert E. Lee high school. I can tell you that they did NOT want the name changed. Here is some information on this ridiculous name change. 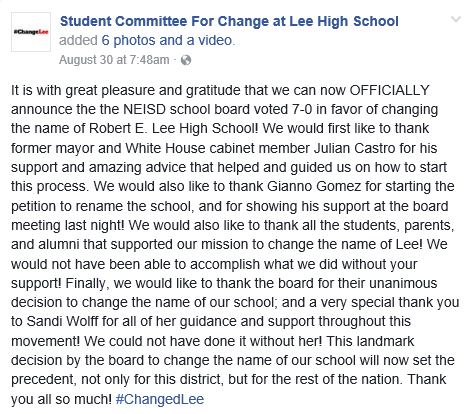 The NEISD meeting was held without allowing anyone to speak so only the board members voted to drop the name of Robert E. Lee. The vote was 7-0 in favor of dropping the name. Their reasoning was that the students come first and they wanted to have the name changed. According to a board member that I could not identify on the video, she was looking for 60% of the students support and 30% support from the graduates of the last 5 years. She also made the wild comment that the money would come from 60% of the NEISD, taxpayers, and 40% from the students through donations. How crazy is this comment not having the money to make the change? Also since when do the students tell the board members how to vote? If this is happening in the NEISD, it’s time to fire all the board members and let the kids take over. I won’t even go into the fact that these students have absolutely no knowledge of Robert E Lee or the ramifications to gathering the money to make the change. Each student that voted to make the change should cough up the money to implement the change even if after high school or college their wages are garnished until the cost is fulfilled. These students who were given recognition will graduate in the future, class of ’19, class of ’21 have now been empowered to make decisions that will only generate more dysfunction in the classroom. After they leave their ‘safe’ place with the liberal teachers what will they do? Gianno Gomez should take charge of doing the collecting since he collected the signatures for the petition. It seems that a Wolff was involved in this underhanded attack. And just take a look at who ‘helped’ these poor mentally impoverished students, non-other that Julian Castro...doesn’t his mom, Rosie, HATE the Alamo? So is the Alamo next? San Antonio and Bexar County now have the three musketeers, Nelson Wolff, Julian Castro, and Ron Nirenberg, but they have no intentions of doing right by the people; on the contrary their allegiance to the progressive or socialist movement is more important to them then the will of the people. These deliberate progressives will do whatever it takes to achieve their goal, even if they have to manipulate the thinking of the uneducated and apathetic constituency to get their desired results. Beware San Antonio, the Rodeo has just begun!